SUSTAINABLY SOURCED: JUST Water is natural still spring water that comes from Glens Falls, NY. It has a high pH of 8.0, so it's naturally alkaline. We only bottle a fraction of their excess spring water, and we pay fairly for it, which puts money back into their community. We're proudly B Corp certified. PLANT-BASED BOTTLE: Our natural alkaline spring water comes in a bottle that's made made from plants. The cap is made from sugarcane. The bottle is made from paper that comes from FSC-certified forests-that means that the paper pulp we use to make it comes from trees that are responsibly harvested, and then replanted. ECO-FRIENDLY: The bottle is made from renewable materials, which contributes to a reduction in carbon emissions. Using plants for much of the material content in the bottle means a reduction in carbon emissions by up to 74% compared to an average plastic bottle, which starts out as petroleum #truth. NATURALLY HIGH pH TASTES DELICIOUS: Our water has a naturally occurring pH of 8.0 (+/- 20%). Anything above 7.0 is considered alkaline. 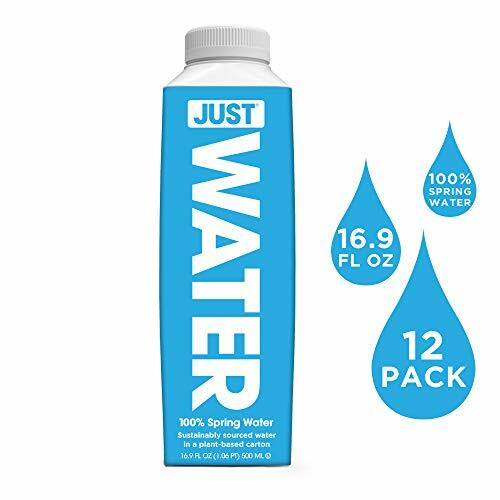 The JUST carton is designed to protect the natural spring water inside from ambient flavors, so it always has a pure, crisp taste. 100% RECYCLABLE ALTERNATIVE TO PLASTIC: most single use plastic bottles are made with petroleum, which can take thousands of years to regenerate. That's why we wanted to use materials that regrow quickly on their own. Plus when the JUST carton gets recycled, it goes on to become tissues, paper towels, even building materials! Check to see how your local community handles bottle recycling. Final Price as low as $14.62 Shipped!